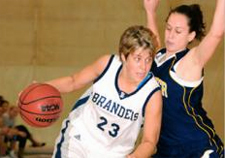 Brandeis women's basketball guard Jessica Chapin '10, coming off a record-setting performance against Carnegie Mellon University, will lead the Judges back into action this weekend against sixth-ranked Washington University. Brandeis faces the Bears at 6 p.m. on Friday, Feb. 12, when they will take part in the Women's Basketball Coaches Association (WBCA) Pink Zone promotion to raise breast cancer awareness. All fans who attend the game are asked to wear pink articles of clothing. Chapin, who was named University Athletic Association (UAA), New England Women's Basketball Association (NEWBA) and Eastern College Athletic Conference (ECAC) Division III New England Player of the Week for the second week in a row, averaged 27 points, 3.5 rebounds, 3 assists and 2.5 steals. She shot 53.8 percent from the field (14-26), 69.2 percent from three-point range (9-13) as the Judges won twice at Case Western Reserve and Carnegie Mellon. After posting 18 points and five rebounds against Case last Friday, Chapin wrote a new chapter in the Judges' record book against Carnegie Mellon on Sunday. In a 59-50 win over the Tartans, Chapin set a pair of school records scoring 36 points (9-15 FG, 7-9 3FG, 11-13 FT) to erase the previous mark set by Pam Vaughan '90 twenty years ago. She also set a school record with seven three-pointers, needing just nine attempts. She scored the team's first 11 points and then 15 of the last 16 to help blow open a four-point game. Chapin added four steals, two boards and an assist against the Tartans. She also tied a school record with her sixth career game of 25 or more points. Chapin is now the UAA's leading scorer, averaging 17.8 points per game, more than 2.5 points more than the next-highest player in the league. She also ranks third in the association with 2.4 steals per game and is tied for second with 1.9 3-pointers per game. Chapin is the only player in Brandeis women's basketball history to rank in the career top 10 in scoring (1,214 points, sixth place), rebounding (498, tenth), assists (246, sixth) and steals (235, third). She has helped the Judges to a 13-6 record, including 6-3 in the UAA, good for third place in the conference. In addition to the Brandeis women's game on Friday against Washington, the twenty-first-ranked Brandeis men take on the third-ranked Bears at 8 p.m. On Sunday, Brandeis hosts Chicago in a UAA doubleheader as well, with the men playing at noon, followed by the women at 2 p.m.
Click here for more information on Brandeis Athletics.